The reformation of the emergency healthcare system that will start in 2019 with a pilot project in five regions will be a priority for the introduction of changes in the healthcare system, the press service of Ukraine's Health Ministry has reported. "The system of emergency medical care needs tangible changes. The ambulance reform is one of the priorities of the Health Ministry for 2019," the press service said. The ministry said that for systemic changes, first it is necessary qualification training of emergency healthcare brigades to the level of global standards and salary increases for professionals who have been trained in accordance with modern methods of saving lives. 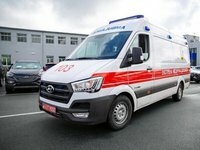 In addition, throughout Ukraine, it is necessary to form modern dispatching services united by a single electronic system, and also to provide the emergency healthcare system with new transport equipped with all the required equipment. According to the ministry, in general, these changes will cost UAH 10 billion for the national budget. The ministry also said that the first stage of changes in the emergency healthcare system starts in Donetsk, Odesa, Ternopil, Poltava, Vinnytsia regions and Kyiv city. These areas were chosen as pilot because they have all the necessary infrastructure and opportunities for retraining of medical professionals. In addition, they have demonstrated managerial effectiveness in reforming the primary care. The draft national budget for the next year envisages UAH 1 billion for the emergency healthcare reform. Earlier, Prime Minister of Ukraine Volodymyr Groysman said that the same amount will be sent to the reform from local budgets. Commenting on the statement made earlier by member of the Verkhovna Rada health committee MP Iryna Sysoyenko, stating that the national budget for the next year provides funding only for five regions, the Health Ministry said that this information is not true. "The draft national budget for 2019 provides about UAH 6 billion for the financing of emergency healthcare through the mechanism of the subvention. Statements of the people's deputies that the national budget provides funding for emergency healthcare for only five regions and Kyiv are not true," the press service said.